Our dear friend Rich shared his mom’s old German recipe with us. Frau Christine Schaus Hybner inspired this amazing treat. Vielen Dank Frau Hybner! We have modified this recipe beyond recognition, but would not have put it together without her. So here it is enjoy! Frau Hybner, we owe you a batch and Rich, thank you. PS: she dips hers in dark chocolate…we opted out only because we eat our fare share of dark chocolate anyway. Pre-heat oven to 350. Whip egg whites until totally stiff. Mix together all other ingredients well, then very carefully fold them into egg whites. Scoop out with an ice cream scooper and place onto to parchment paper lined cookie sheets (you will need two). 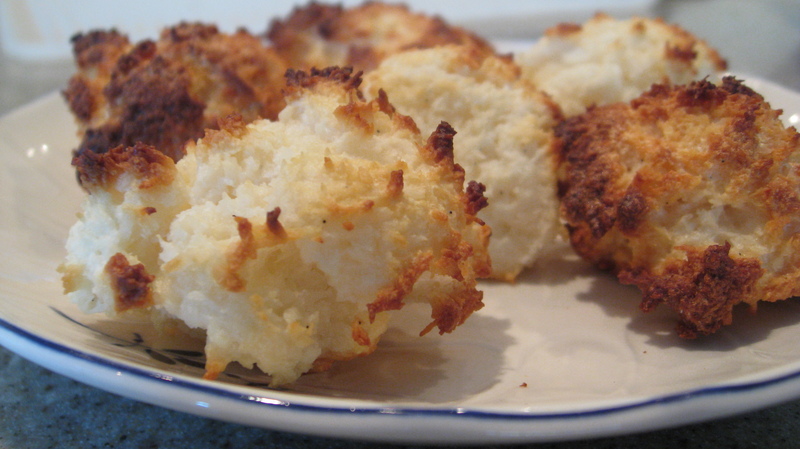 Bake on convection setting for 12 – 15 minutes or until golden brown. These look delicious. What heat setting should I use if I don’t have a convection oven? Thanks!